The family of plant oil stoves, including the Protos stoves, were designed to be safe, and reliable cookstoves for low income residents of Indonesia. BSH found that despite having a lot of plant oil available, there was no reliable network of distribution of that oil, and it was keeping users from being able to use the stove. The plant oil stoves also require a lot more cleaning and maintenance than kerosene stoves. Between the difficulty in getting fuel, and the additional maintenance, it was difficult to expand the stove project beyond the initial pilot projects, and BSH eventually concluded that this project was unfeasible. An Update from BSH on Protos. The Plant Oil Stove. For a brief update BSH is preparing a mass production capacity that should come on-line in late autumn of this year. Initial production will be ramped up through Q4 so we can expect to produce several thousand units in 2009. We are working with a local Indonesian partner - in an OEM process with 100% local content. This is part of our goal, but since BSH is not present in any meaningful way in our conventional business in that country, it is a very new activity for us. Thus, the time line may be subject to delay if quality or other issues arise. I would rather delay a few weeks than deliver a defective product. The initial cost is going to be around US$40 - 42 Ex-works. This means it does not include transport or tolls if moving outside of Indonesia. Our total capacity for 2010 should be around 50,000 units - so this price will hopefully edge down. Naturally currency fluctuations will also play a role. BSH is running the project as a "social business". This means our goal is simply to cover costs and any additional profit will be put back into the project - for instance subsidizing costs in countries where there is viability, but not enough purchasing power for the capital costs. The mentioned price is the cost of production and local overhead. No more. Larger orders do not generate greater discounts. At first all orders will be filled out of Indonesia. New production capacity requires a minimum annual demand of 25,000 units and a viable infrastructure in the desired region. With perhaps the exception of the tank and some cleaning tools, it is simply not possible to establish small-scale local production that ensures consistent quality in an economically viable manner. The long term test of the Jatropha oil being used in the BSH stove is currently under way in Tanzania in cooperation with GTZ-ProBEC. Preliminary tests are giving very positive results, even though with Jatropha oil being produced on small scale. Purity of the oil seems to play a crucial role, but we will be able to tell more early 2007. 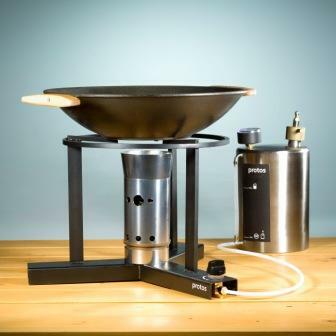 The stove is designed for using straight plant oils, no need to convert them into Biodiesel. However, Biodiesel can also be used. President Gloria Macapagal Arroyo yesterday ordered the mass production and distribution of a new cooking device that runs on oil harvested from plants to 18 “hotspot” urban poor areas all over the country. Mrs. Arroyo said the Leyte State University should fast track the production of Protos, which can run on jatropha oil, among other plant-based oil products, to help Filipino consumers cope with the rising cost of living. “We will support the mass production and distribution of this cooking oil in 18 hotspots in the country to benefit those living in urban poor areas,” she said. The Leyte State University is producing Protos, which is manufactured by German firms Bosch and Siemens Home Appliances Group. Mrs. Arroyo said while the introductory price at P2,000 may be considered prohibitive, mass production will eventually lower the price of the plant oil-powered appliance. 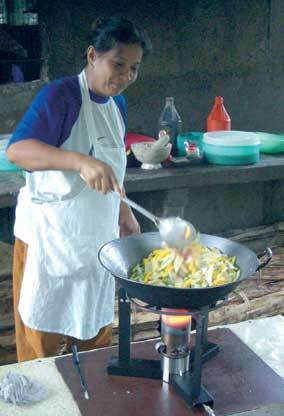 Protos, also known as jatropha stove, was officially launched in Malacañang yesterday. The President also ordered the immediate release of P500 million for the Philippine National Oil Co. for the planting of jatropha plants, locally known as tuba-tuba or tubang-bakod. Socioeconomic Planning Secretary Romulo Neri said the country imports about $7 billion worth of oil and petroleum products, 25 percent of which is diesel. Once the jatropha methyl ester product is mass-produced, it can translate to a savings of $1.75 billion. The PNOC and the Armed Forces have signed an agreement for the conversion of idle lands in military camps into plantations for jatropha, a potential biofuel source. Another P500 million will be sourced from National Development Co. for the mass production of jatropha cooking oil and jatropha methyl ester as an alternative gasoline blend. Lt. Gen. Romeo Tolentino of the Northern Luzon Command said 150 hectares have been allotted by the Armed Forces for the test planting of jatropha. The Camarines Sur provincial government has also set aside 10,000 hectares of land in the towns of Lagonoy, Caramoan, Presentacion, Pili, Calabanga and Sipocot to serve as jatropha farms. According to Jun Lozada, president of the Philippine Forest Corp. which is a subsidiary of the Department of Environment and Natural Resources, about P50 million of the P500 million PNOC budget will be used for further research. “Per hectare, a jatropha farmer can earn P10,000 to P15,000 for the first year, and after five years that will plateau at P60,000 per hectare,” Lozada said. Jatropha planted from seedlings would start yielding fruits after six months, while those planted from cuttings would have an earlier yield at one to two months. The University of the Philippines-Los Baños is now developing the protocol for the tissue culture of jatropha to mass produce the plant cuttings. UPLB aims to come up with a high-quality jatropha seedling that is free from viruses, bacteria and fungi.